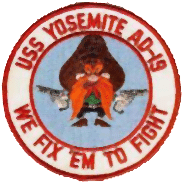 The USS Yosemite Association website is dedicated to the memory of the USS Yosemite AD-19 and the men and women that served aboard since she was commissioned on March 16, 1944. A former shipmate, Bill Krug had served two years aboard “The Busy Lady” and now serves as the current the Association President. Bill has improved the website by having it upgraded to the newest Open Source technology. Many shipmates and crew members have also volunteered their time, talent and resources to our Association over the past 30 years to preserve the ships’ memory. We hope you enjoy our website and can experience the “The Busy Lady” through the pages of our site and get a little bit of the feeling of being aboard her in her glory days. We extend a hardy welcome and a salute to all visitors of the site and personal invitation to those shipmates that served on the USS Yosemite to join us. Also, we ask you to consider financially supporting us by continued annual membership dues or donations, as well as, new membership. Membership dues of $15 annually will provide the needed supported to run our association, publish the newsletters, website administration, and reunion planning. Only with your financial support are we able to carry on to honor the crew and keep the memory of USS Yosemite AD-19 alive! If you are a family member of someone who has served aboard the USS Yosemite, we appreciate your support, photos, comments and any stories you can share with us.